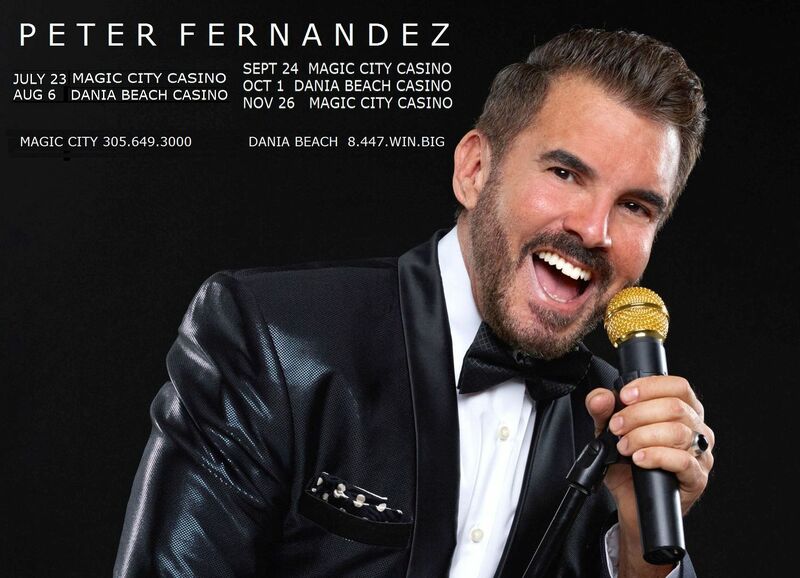 Peter Fernandez | Singer, Showman, Entertainer Peter Fernandez makes an unexpected comeback bigger than ever at Magic City Casino. 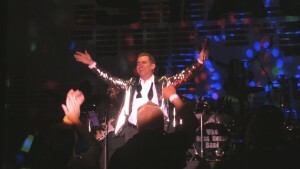 Broadway Lights and Disco Nights is a variety show of musicals throughout the decades. 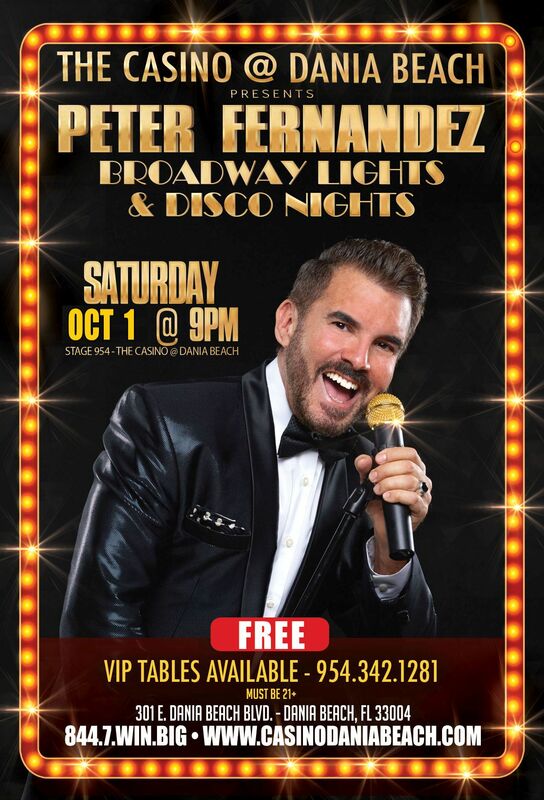 It is the most complete evening of entertainment ever before offered in South Florida featuring 10 musicians, talented backup singers and the vocal dexterity and commanding stage presence of Peter Fernandez. This one of a kind show is the first to combine the best of live musical theater followed by a fun filled after party for your dancing pleasure. After a great show, you can dance the night away in an atmosphere reminiscent of the great clubs of the 70s & 80s Disco Era withou having to leave the venue! The Broadway segment includes your all-time favorite classics as well as music from current shows now running on Broadway. You’ll hear the greatest songs from shows like “Rock Of Ages,” “Beautiful (The Carole King Musical),” “An American in Paris,” “Grease,” “Jersey Boys,” “The Phantom of the Opera,” “Wicked,” “Hair” and others. A fun filled night with the greatest music of the baby boomer generation! All who love the music of this era will thoroughly enjoy dancing to the best music of the 70’s and 80’s. You’ll dance to Donna Summer, Barry White and everything in between. Peter’s band are a group of 10 incredible musicians who play everything from the best 70’s funk to the Motown classics that inspired it all. Singer Peter Fernandez is a pioneer of the Miami Sound who has sold thousands of records as lead singer to two of Miami’s most popular 70’s bands, Coke & The Antiques. 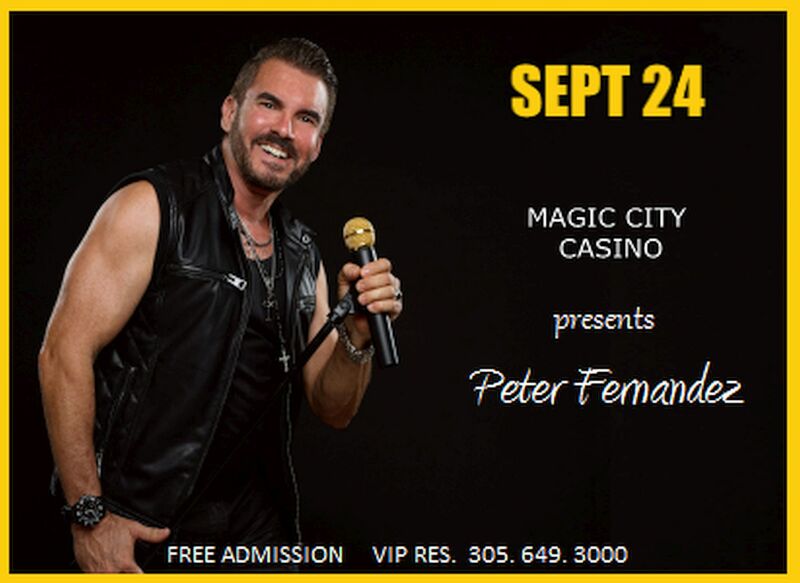 Peter Fernandez & The Open House Band with continuous music by Carlos Dj Sonic have been packing Magic City Casino since Peter’s first Miami comeback appearance on Nov. 25th, 2011..